Luc Van Tan, a HCM City resident, is considering installing solar power panels on his 35sq.m rooftop to save on electricity bills. But the initial investment for the panels has made Tan think twice. It costs between 25 million VND (1,070 USD) and 30 million VND (1,280 USD) for each 10sq.m panel. That means Tan would have to spend about 90 million VND (3,840 USD). In spite of the long-term profits solar power brings, many families hesitate to install the panels due to the cost. It is estimated that it takes just five years to recoup the investment but not all families can afford the initial outlay. Two years after home solar systems were launched, only 1,800 customers including offices, businesses and households had so far invested in rooftop panels, according to the EVN. “The power generated is below the country’s solar energy potential,” Nhan said. Solar panels not only help people to cover their domestic electricity demands but also contribute to the national power grid. The EVN has said it would install electricity meters in houses to measure extra rooftop solar power and buy from customers who were willing to sell. However, this preferential policy has been held back by late legislation. EVN had been unable to sign contracts with customers because there were no instructions regarding payment methods, Nhan said. The corporation has asked the Government to offer financial incentives and call on investors to support home solar system. The country’s largest power generator is also working with the German Development Bank KfW and has asked the Government to use the bank’s solar power development package worth 14 million EUR to support home rooftop solar panels. According to the EVN representative, if approved, each household would receive from 2 million VND (85 USD) to 6 million VND (255 USD), depending on panel capacity, for the installation. The assistance was only a small package but would encourage more families to install panels. Many customers complained that they did not know which panels to install or how to maintain them. The EVN was considering high-quality solar panel suppliers and would publish list of qualified companies on the corporation’s website as a reliable reference source for customers, Nhan said. Vietnam’s annual power consumption has increased by 10 percent in recent years, and the country is at risk of facing power shortages in the 2020s. According to environmental experts, renewable energy like solar would play a vital role in helping Vietnam accomplish its long-term goal of hooking up the whole country to the national grid. Cao Quoc Hung, Deputy Minister of Industry and Trade, said at a renewable energy workshop this week Vietnam had witnessed a ‘wave’ of local and international investment in renewable energy thanks to consistent policies and support mechanisms. As of the end of last year, about 10,000MW of solar energy had been generated by large solar projects. More than 100 power purchase agreements were signed with two of them with total capacity of 86MW. According to renewable energy researchers, the country’s solar system had huge potential to reach 35,000MW by 2030. Vietnam has focused its solar power development on both home rooftop systems and large projects invested by domestic and foreign investors. The Government has applied favourable feed-in tariff incentives or renewable energy payments for solar power since 2017 in an attempt to accelerate investment in renewable energy. The fixed solar power price is set at 2,086 VND (0.08 USD). 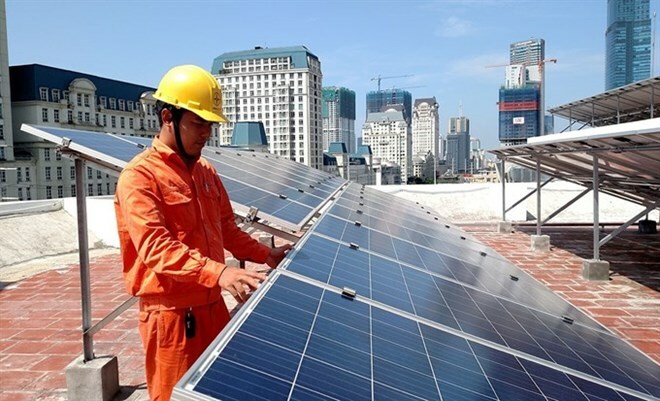 Phuong Hoang Kim, head of the Electricity and Renewable Energy Department of Ministry of Industry and Trade told Thanh nien (Young People) newspaper the incentives had boosted the solar energy market. However, the prices for solar power are fixed regardless of the amount of sunlight different areas receive, resulting in less interest in cooler areas. The Ministry of Industry and Trade is drafting new prices for solar energy based on geographical zones and opening the floor for feedback. Kim said that the proposed price change aimed to stabilise the number of solar energy projects based on the rule that low prices should be applied in sunnier areas so investors could still profit if they invested in areas with low levels of sunshine.